Looking for team award ideas? Consider something beyond the usual canned, all-purpose “recognition awards”. Employee recognition should play an essential role in the culture of your organization. And if you need confirmation of that, you’ll find it just about everywhere—from scholarly considerations in the Harvard Business Review to those fishy-looking, self-serving “white papers” offered up by corporate gift companies. But what these sources tend to be a lot less forthcoming about is what exactly you should be recognizing those employees with. And that’s especially true if your goal is to recognize them with something that will resonate with them, something somewhat more meaningful than one of those off-the-shelf, all-purpose, interchangeable “recognition awards”. Lucite celebrating the unveiling of the “Philly Philly” statue, which celebrates a trick play instrumental in the win by the Philadelphia Eagles over the New England Patriots in Super Bowl LII. The piece—given to personnel in the Eagles organization—incorporates fragments from the actual ceramic mold used by the sculptor. The challenge of finding something customized, something that will have cachet for recipients, is even greater when it comes to team awards. What makes team awards different? Team awards or gifts by definition recognize a group effort, usually one involving a considerable and sustained investment of time and energy. The project being honored might involve the development of a new product or drug; the attainment of a stage in research; a successful IT integration; a favorable ruling in litigation; the raising of capital for a new fund, or the launch of a new marketing or advertising campaign, just to cite a few examples. It’s precisely the nature (and degree) of focus that first sets team recognition apart. Project teams typically involve a relatively small group focused on a single outcome. And achieving that outcome most often requires–demands—dedication, patience, and narrow, sustained focus. All of this reflects a real emotional investment that the team member has in both his or here work individually, and as well as that of the team. With that emotional investment comes a great degree of pride, fulfillment, and, most importantly, some expectation of recognition. Beyond that, today’s project teams are not only increasingly diverse, but also often geographically dispersed. Given the higher threshold for recognizing team members, both collectively and individually, what’s the chance that they will be satisfied with some cookie-cutter award or gift? Full disclosure: the team awards and gifts shown here are all made of either acrylic (Lucite) or crystal—and our company designs and sells awards made from acrylic and crystal (along with resin, wood, and pewter). And while the majority of the pieces we sell are customized, it’s important to note that we also provide clients with more traditional pieces, closer to what we’ve described here as “off-the-shelf”. 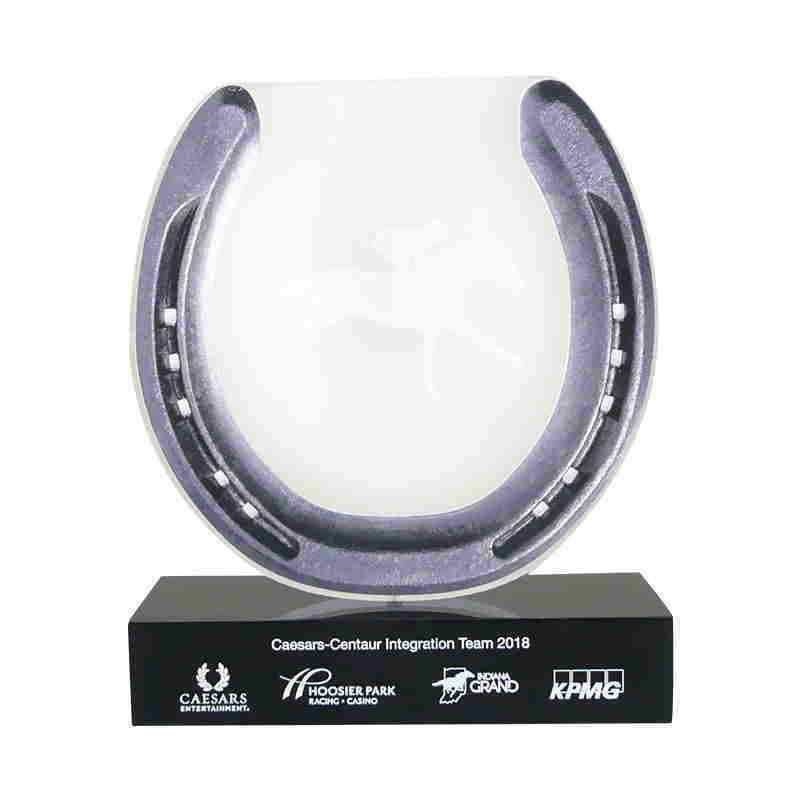 Our point is when it comes to ideas for team awards and gifts, custom awards are especially appropriate and effective. The second point is that, again, we have only shown acrylic and crystal designs here. Some of the ideas we suggest can be adapted to other media; some, on the other hand, can’t. One advantage of acrylic and crystal that especially is the fact that they can so easily manipulated into a multitude of shapes. This one characteristic opens up a number of possibilities. You might, for instance, want to base a design on an organizational logo, mascot, or a product. 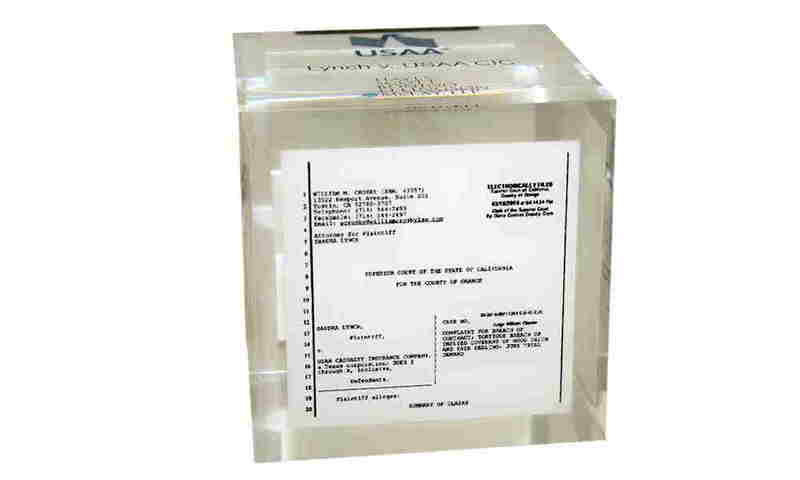 Acrylic also has some unique capabilities, as demonstrated for instance in the piece below in which the FDA approval of a drug is commemorated with an actual vial placed inside the award. Once again: our advice here is not linked to a specific material or materials, but some of the effects we discussed are best achieved through certain materials. The common denominator in the suggestions below is that they are tailored specifically to the work of the team. That team might have been engaged in drug research, litigation, a product launches, a joint venture negotiation, an IT project, or any of a number of other endeavors. The goal here is to provide team members with something that truly reflects their effort and dedication– something that will serve as a tangible, and distinctive reminder to them and others of their participation in something of real importance to them. Something, in other words, that is not generic, and not simply ordered by catalog number from a menu of similar-looking recognition awards and gifts. The distinctive character of a project can often be captured via the industry or subject area involved. A recent design for an internal recognition award played directly off an industry theme. 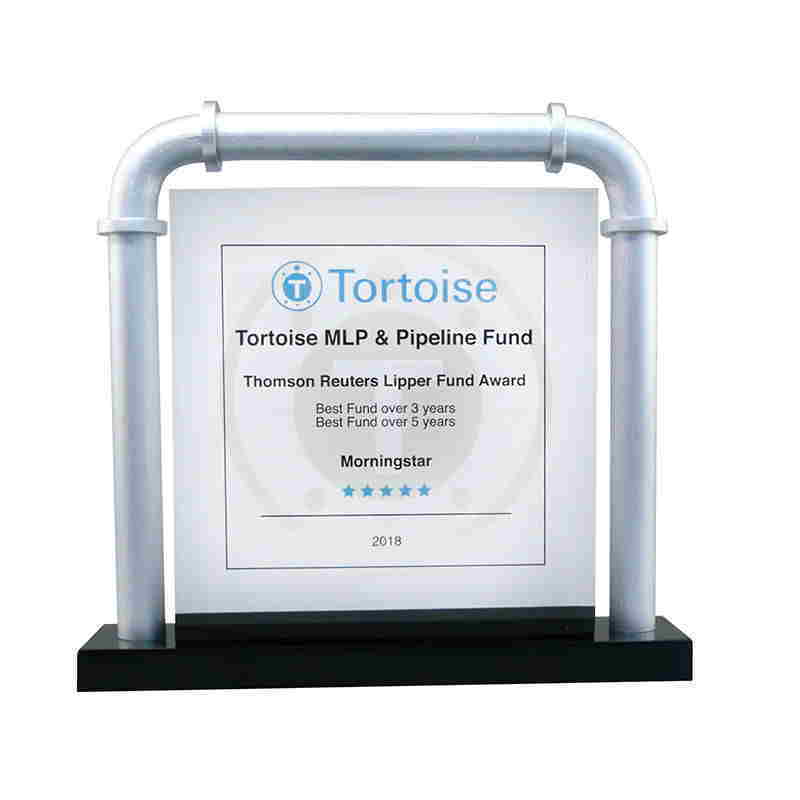 The piece recognized the Tortoise MLP & Pipeline Fund as a recipient of a 2018 Thomson Reuters Lipper Fund Award. 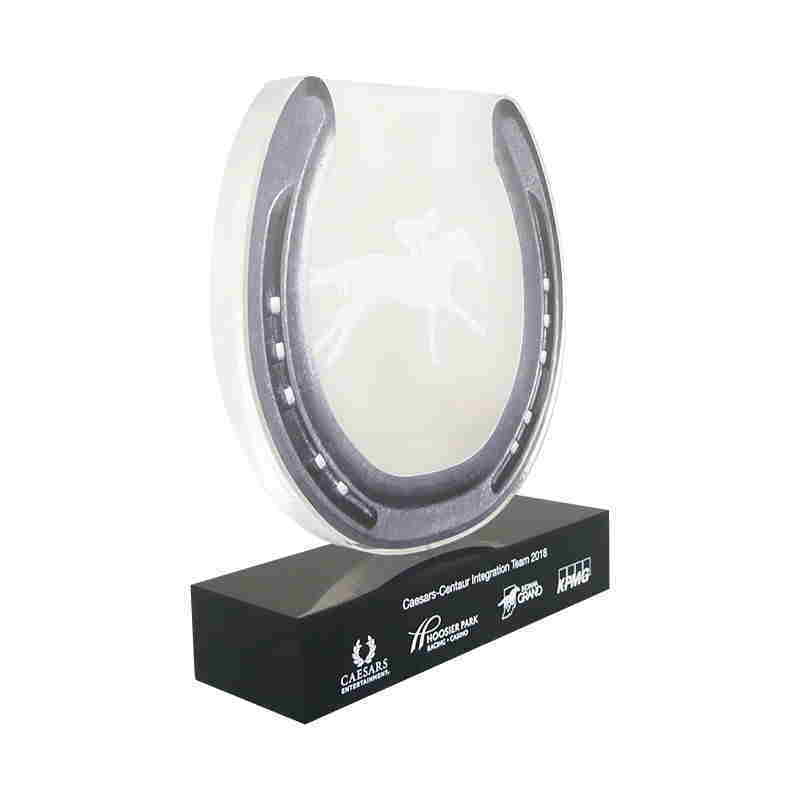 The horseshoe theme of the acrylic design shown below, commemorating an IT integration project, plays off the fact that project work was performed for the gambling industry. Team award recognizing a successful IT integration in the gambling industry. 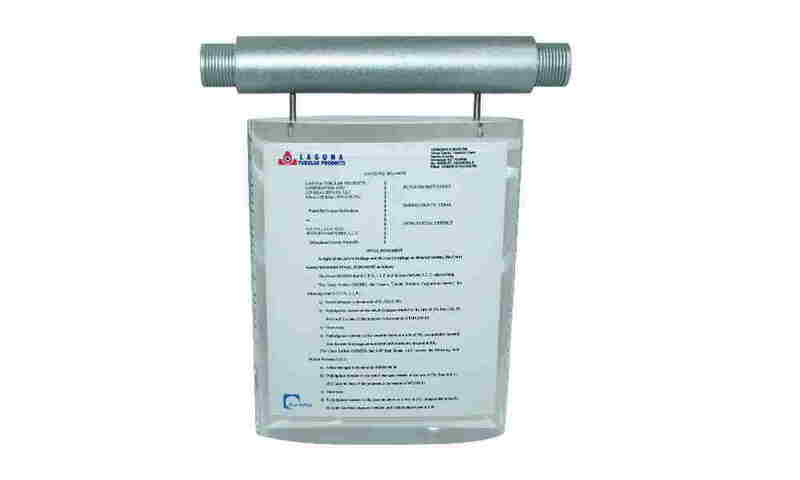 Similarly, the litigation commemorated with the design below involved a manufacturer of carbon steel pipes. A custom design commemorating a successful outcome in litigation involving a producer of carbon steel pipes. Obviously, not all projects are going to lend themselves to gifts and awards of this sort. Even so, many do—and this type of design is one that is often neglected. (Follow this link to see more examples of industry-themed custom awards). This suggestion might seem self-evident, but their are any number of ways that it can be enacted. After all, what more succinctly conveys the unique character of a project than its defining goal? A tangible result of a project team’s work–let alone success–is obviously not always going to be available. But, again, for many projects some concrete evidence will be at hand. In the team recognition piece below, the goal of the project team takes the tangible form of the vial embedded here in acrylic. 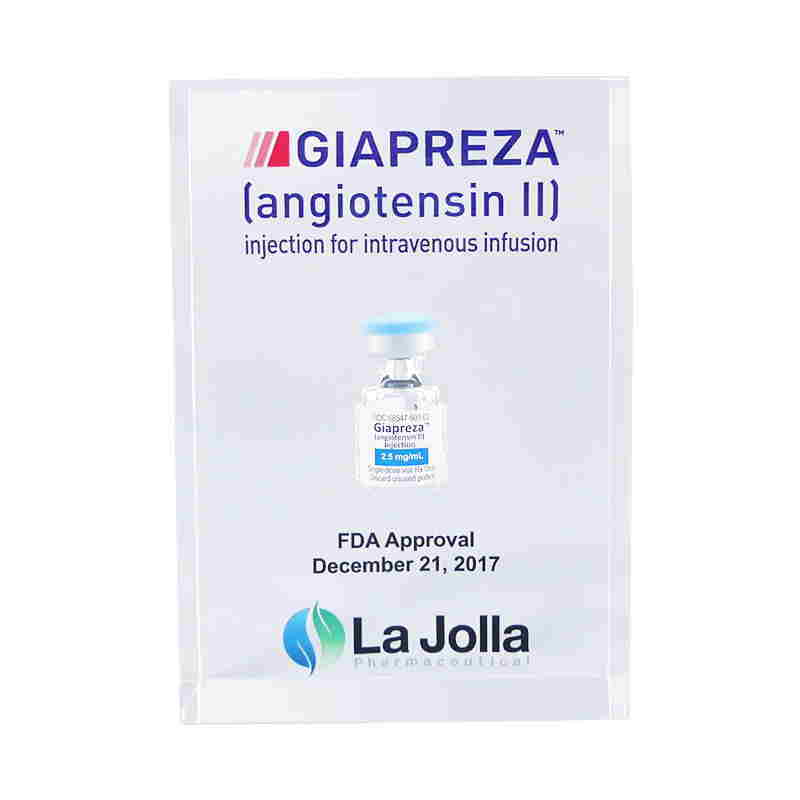 Even more, it is hard to conceive of a more unique and compelling way of conveying the central work a team—in this case, obtaining FDA approval for a drug treating dangerously low blood pressure—than through the labeled vial actually preserved here. 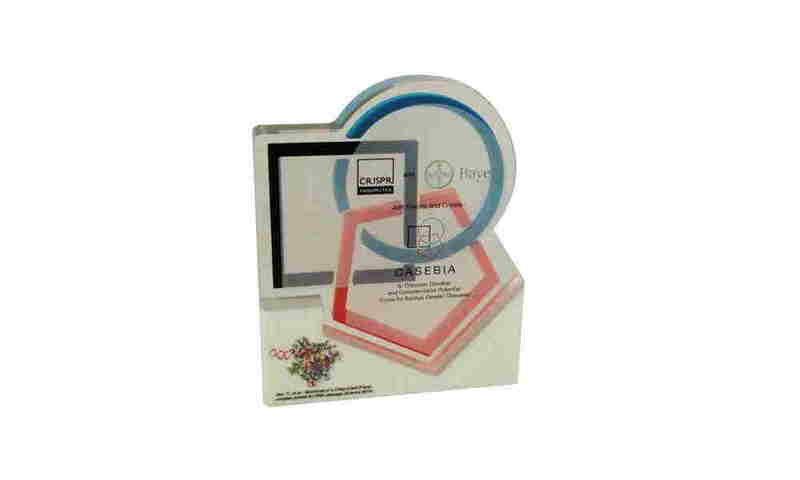 Acrylic piece, with actual embedded vial, recognizing the successful effort to gain FDA approval of Giapreza, developed for treatment of low blood pressure. As noted earlier, the tangible representation of a project’s successful completion doesn’t have to be so literal. In the piece below, it is represented by the red “Claim Dismissed” stamp on the plaintiff’s pleading (along with more information explaining the context of the suit itself). The acrylic piece below documents—and commemorates—not only the outcome of the lawsuit but also the various critical stages of the litigation. 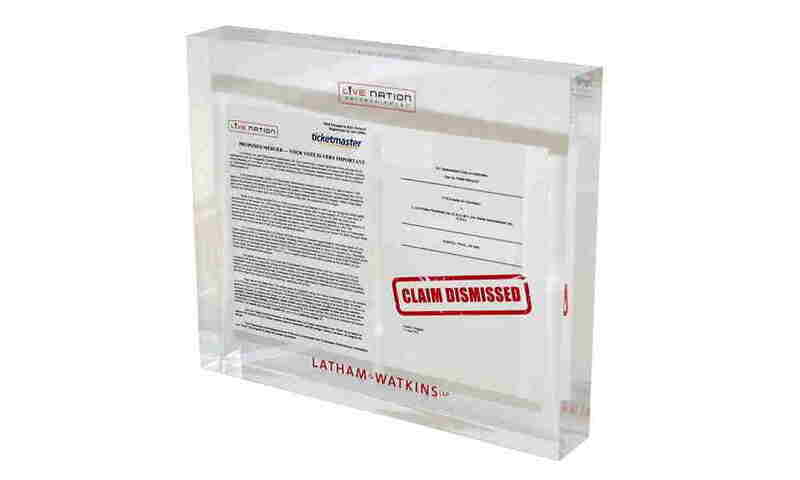 Custom Lucite commemorating successful litigation and incorporating trial documents. Do all projects involve groundbreaking undertakings—promising enduring and abundant benefits for all of humankind? But the significance of many projects can be elevated by providing some context. The acrylic piece below, for instance, commemorates a successful outcome in litigation—by providing headlines devoted to the case from several sources. Team award celebrating successful outcome in litigation, and documenting the case’s significance. Will all projects be the subject of press coverage? But many will attract the attention of specialized or industry sources—at least enough to capture, to some degree, the significance of a project’s aims or goals. And here again: it is crucial to keep in mind the demands on many project team members, and the intensity of the commitment required of them. Team project can often involve participation over months—even years. Many team members can undoubtedly cite a litany of personal sacrifices—lost weekends, cancelled plans, scrapped holidays, missed gatherings. Providing a tangible and lasting reminder of the rationale for that sacrifice is can be very powerful. A secondary benefit comes from the marketing and branding value of displaying in offices , reception areas, conference room a piece that conspicuously highlights significant achievement on behalf of your group, department, office, division, firm etc. This idea is especially applicable in instances in which a team’s achievements are a critical, though intermediate, part of a broader mission or goal. In other words, though what has been accomplished by the team is certainly worthy of recognition, it is also recognized to be a step in a longer process. And this is where brand building, and especially the experience of investment banks, in using gifts and awards for brand building, can be really instructive. Investment bankers learned long ago that gift-giving and recognition have their constraints. Among the most commonly given “team awards” are so-called “deal toys” . 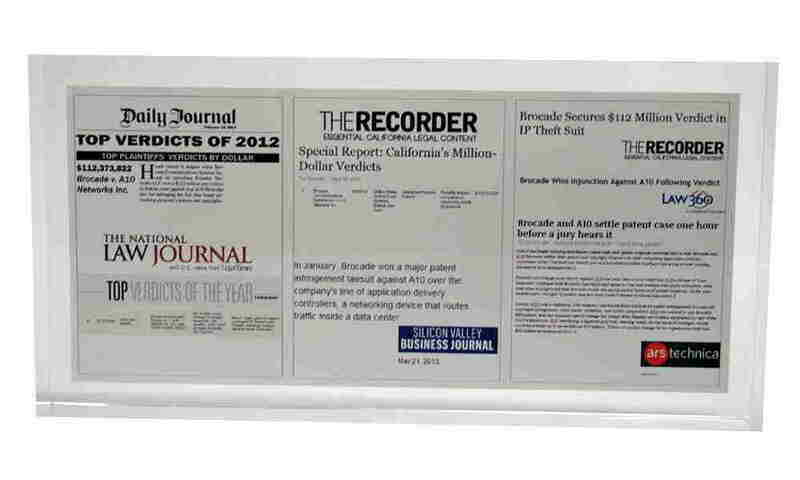 These have been used by investment banks for over 40 years to commemorate transactions. On completing a deal, investment banks wanted to give their clients gifts, and or all the traditional reasons: expressing gratitude for business, solidifying the client relationship with the client, and keeping their name in front of the client (now endlessly referred to as staying “top of mind”). On completing a transaction, investment banks used to give conventional “corporate gifts” such as high-end pens and clocks. They found, however, that their client gift-giving soon reached a saturation point. After all, how many expensive clocks does someone need? And how many pens can you give someone—especially when other banks are giving out the same things. And beyond that, pens, high-end or otherwise, get lost or misplaced or permanently borrowed by co-workers. How was any of this helping solidify client relationships and furthering the bank’s brand? As a result of the limitations of “corporate gifts”, investment banks soon began giving clients deal toys at the conclusion of transactions. Unlike conventional gifts, these deal toys could be heavily customized—and tailored to the specifics of the transaction itself. This level of customization, and often great creativity, evident in the design of these deal toys vastly increased the perceived value to the prime recipients—the bank’s clients. And precisely because these deal toys had perceived value, clients kept them. They displayed them in their offices. They showed them off to others who came to the office. They saw them everyday. And each time these clients looked at them, they also, importantly, saw the investment bank’s name and logo…making it that much more likely that, the next time they need to do a deal, that bank would be the first to spring to mind. Yes, deal toys serve a purpose. These seemingly frivolous, self-indulgent “toys” actually serve 3 very critical ends (and if they weren’t serving some cost-effective purpose surely investment banks, of all institutions, would have recognize the fact and abandoned them long ago). They recognize and reward the “deal team”—the bank’s own employees who worked on the transaction. Again, because of their creativity and perceived value, client recipients value and display these deal toys—displaying the investment bank’s name and logo, and therefore furthering its brand. Their typically creative designs eye-catching displays in either the offices of individual bankers, or in common areas like conference rooms and reception areas. Importantly, they serve as a silent and yet conspicuous “visual resume” for both clients and prospects of both individual bankers, as well as their group and firm. The team award below provides an example of the same kind of brand building that investment banks have achieved through deal toys. 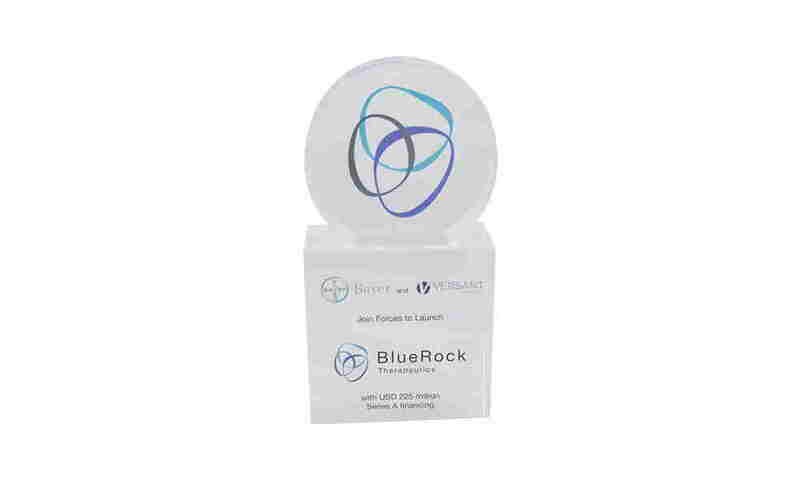 The piece commemorates the creation (and funding) of, BlueRock Therapeutics a joint venture between German pharmaceuticals firm Bayer and healthcare investment firm Versant Ventures. The work of this joint venture by no means over. (BlueRock, among other projects, is currently establishing a research collaboration with New York’s Memorial Sloan-Kettering Cancer Center). The piece below, centered on the joint venture’s unifying logo, help to reinforce and further the identity of the new entity. Commemorative marking a joint venture in the field of cell-based therapy. The design below serves a similar branding function—incorporating not only the two institutions contributing to the joint venture, but also that of the joint venture itself. Team recognition award marking a joint venture focused on gene-editing therapeutics. 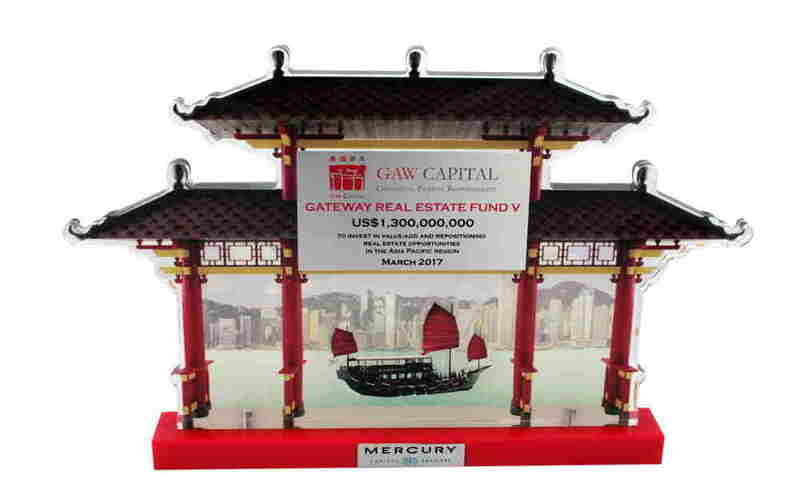 Team award recognizing the raising of capital for a Hong Kong-based real estate investment fund. You don’t have to delve into various cognitive studies to recognize that people have a certain visceral excitement at hearing or reading their names. In a Washington Post article on the power of one’s name, a psychologist put it pretty succinctly: “A person’s name is the greatest connection to their own identity and individuality”. We can’t claim any professional insight here, but we do know from almost 40 years of experience that adding an individual’s name—especially in a group or team context—can make a huge difference in its perceived value of an award or gift. And the cost difference of personalizing is usually minimal, and certainly far outweighed by the benefits. David Parry is the Director of Digital Strategy for The Corporate Presence and Prestige Custom Awards.